No she is not cleaning… This broom is meant to fly with! This witch loves to fly around and enchant people. The doll will be about 24 cm tall. I bought this pattern to add to my collection so I don’t know when I will make it up. The pattern is beautifully written, easy to follow and contains many photos which are very helpful. Hi, stopping by to say that I’d LOVE to have this pattern. So seriously cute!!! You have surpassed yourself with this one! She is gorgeous! Oh my goodness, she is the cutest yet! She is so cute. She would look great flying around my house. I love her. I think your patterns are the best. They are made with love and it shows. Hey Sabrina, I love your patterns. 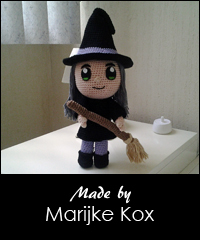 This little witch is so cute!! What a great addition. Thank you for your amazing work. This is a nice looking witch! Cute to give it to a child. I want to make this! Love this but it’s not surprising since I love all your creations! !